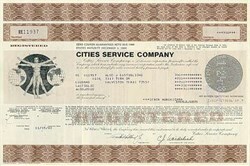 Beautifully engraved Zero Coupon Bond Certificate from the Cities Service Company issued in 1983. This historic document was printed by the Security Columbian Banknote Company and has an ornate border around it with a unique vignette of partially clothed man with globes on both sides. This item has the printed signatures of the Company�s Chairman and Secretary and is over 25 years old. Citgo Petroleum Corporation or Citgo is a United States-incorporated, Venezuela-owned refiner and marketer of gasoline, lubricants, petrochemicals and other petroleum products. The Citgo gasoline brand was inaugurated in 1965 by the Cities Service Company, a United States based energy company that first rose to prominence in the early 1900s. Cities Service Company was acquired by Occidental Petroleum Corporation in 1982. That same year, Cities Service Company transferred all of the assets of its Refining, Marketing and Transportation division (which comprised its refining and retail petroleum business) into the newly formed Citgo Petroleum Corporation subsidiary, to ease the divestiture of the division. In 1983, Citgo and the Citgo brand was sold by Occidental to Southland Corporation, owners of the 7-Eleven chain of convenience stores; 50% was sold to Petr�leos de Venezuela in 1986, and the remainder in 1990. Citgo has supplied 14,000 retailers, but in July 2006 announced plans to cease serving 14% of their independent retailers in the United States. The company traces its heritage back to the early 1900s and an oil entrepreneur named Henry Latham Doherty. After quickly climbing the ladder of success in the manufactured gas and electric utility world, Doherty in 1910 created his own organization, Cities Service Company, to supply gas and electricity to small public utilities. He began by acquiring gas producing properties in the mid-continent and southwest. The company then developed a pipeline system, tapping dozens of gas pools. To make this gas available to consumers, Doherty moved to acquire distributing companies and tied them into a common source of supply. Cities Service became the first company in the mid-continent to use the slack demand period of summer to refill depleted fields near its market areas. In this way, gas could be conveniently and inexpensively withdrawn during peak demand times. In 1931, Cities Service completed the nation's first long-distance high pressure natural gas transportation system, a 24-inch pipeline stretching some 1,000 miles from Amarillo, Texas, to Chicago, Illinois. A logical step in the company's program for finding and developing supplies of natural gas was its entry into the oil business. This move was marked by major discoveries at Augusta, Kansas, in 1914, and in El Dorado a year later. In 1928, a Cities Service subsidiary discovered the Oklahoma City field, one of the world's largest. 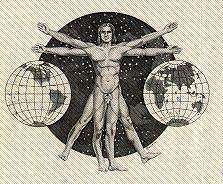 Another participated in the discovery of the East Texas field, which, in its time, was the most sensational on the globe. At the height of Cities Service's growth, Congress passed the Public Utility Holding Company Act of 1935, which forced the company to divest itself of either its utility operations or its oil and gas holdings. In a difficult decision, Cities Service elected to remain in the petroleum business. The first steps to liquidate investments in its public utilities were taken in 1943 and affected over 250 different utility corporations. At the same time, the government was nearing completion of a major refinery at Rose Bluff just outside of Lake Charles, Louisiana, that would eventually become the foundation of the company's manufacturing operation. Using designs developed by Cities Service and the Kellogg Co., the plant was dedicated only 18 months after the first concrete was poured. A month before Allied troops landed in France, it was turning out enough critically needed 100-octane aviation gasoline to fuel 1,000 daily bomber sorties from England to Germany. Government funding through the Defense Plant Corporation (DPC) also prompted Cities Service to build plants to manufacture butadiene, used to make synthetic rubber, and toluene, a fuel octane booster and solvent. The years that followed saw Cities Service grow into a fully diversified oil and gas company with operations around the world. Its green, expanding circle marketing logo became a familiar sight across much of the nation. In 1965, Cities Service first started using the "Citgo" brand (officially styled "CITGO") for its refining, marketing and retail petroleum businesses. Since 1990, it has been owned by corporations controlled by the government of Venezuela. On 27 September 2006 the 7-Eleven chain of convenience stores announced its 20-year contract with Citgo was coming to an end and would not be renewed. 7-Eleven Spokeswoman Margaret Chabris said "Regardless of politics, we sympathize with many Americans' concern over derogatory comments about our country and its leadership recently made by Venezuela's dictator. Certainly Chavez's position and statements over the past year or so didn't tempt us to stay with Citgo." Later she said that "People are making it out to be more than it is." Citgo's Chief Executive Felix Rodriquez accused 7-Eleven of exploiting the situation to score political points against Chavez by pointing out that the decision to terminate the contract had already been made back in July. Citgo launched a national ad campaign in the fall of 2006 emphasizing the company's corporate social responsibility. National television ads also aired through February 2007 featuring ordinary Americans thanking Citgo and Venezuela for providing discounted heating oil to low-income people.